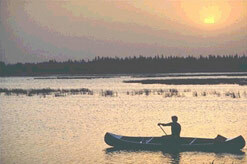 Riding Mountain National Park rises magestically from the surrounding prairie landscape. 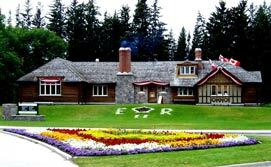 This 3000 square kilometre park is situated along a vast ridge of land known as the Manitoba Escarpment. The eastern and northern edges of the park boast spectacular views of the prairie landscape below. This park supports a wide array of biodiveristy, and includes boreal (northern) forest, eastern deciduous forest, vast meadows of rough fescue grasslands, extensive marshes and river-bottom wetlands. The wild areas of RMNP are inhabited by mammals such as wolves, moose, elk, black bear; hundreds of bird species; fish, amphibians and reptiles; and countless insect species. A captive bison herd is also maintained within the park's border. RMNP was officially opened in 1933, and is rich in historical and cultural heritage. 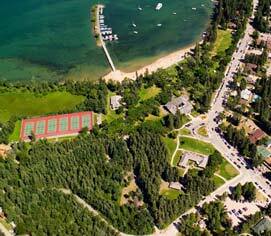 The Visitor Centre in Wasagaming is located in the beautiful Federal Heritage Building. 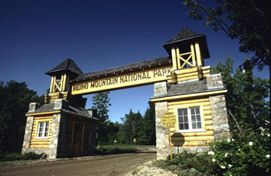 The Riding Mountain Park East Gate Registration Complex National Historic Site of Canada is an important example of the Rustic Design tradition of building in National Parks in the 1930s. There is much to learn of the history of RMNP including aboriginal use of the area, Prisoners of War, Grey Owl and more! Visitor Centre - gift shop, theatre, resource library and the Discovery Room. Sign up for Park interpretive tours and outdoor adventures. Visit the Centre for maps, brochures, animal and bird sighting lists, National Park passes and fishing licenses. Horseback Riding at Trailhead Ranch - Call (204) 848-7649 ext. 512 for information on scheduled trail rides, hayrides and sleigh rides. Outdoor Flea Market - held every summer weekend at Sportsman's Park. Homemade baking, preserves, art and crafts, and more! ...many more dining experiences are available in Wasagaming!